PlayFrank Casino is a charming little site, with a real sense of fun to it that is perhaps lacking from many online casino sites. Chasing high rollers is understandable, but there is a huge market of online casino players who do it for fun, and an entertaining site that puts customer satisfaction first is always going to appeal to those players, and for that reason, those players are going to love PlayFrank! Established in 2014, PlayFrank’s cheeky nature has seen its popularity grow and grow over the last few years, which is no easy task in such a competitive market. But with new sites popping up every day, meaning that more rival sites keep on appearing, it’s not enough to be known to be good, you have to keep getting better. So PlayFrank may be fun, and that goes a long way, but can it back it up with top quality content? Or is this another site with potential, that is ultimately left floundering in the mass of average sites that exist? PlayFrank certainly starts well with its promotions, there’s a hearty welcome bonus (at the time of writing) and a host of regular and sporadic bonuses and promotions to enjoy. When you arrive at PlayFrank, you are immediately met by a cute, one eyed, blue monster, who I assume is called Frank (makes sense, right?). Frank (if that really is his name) is the mascot for the site and will act as your guide somewhat, popping up in various corners of the site to remind you of the fun-loving nature of the PlayFrank site. The subtle, almost pastel colour scheme is a brave choice, but an effective one. Normally when a site is going for pure entertainment factor, the colours will be bold and bright, but due to that, the gentle blues and oranges here feel genuinely refreshing, without taking anything at all away from the concept. 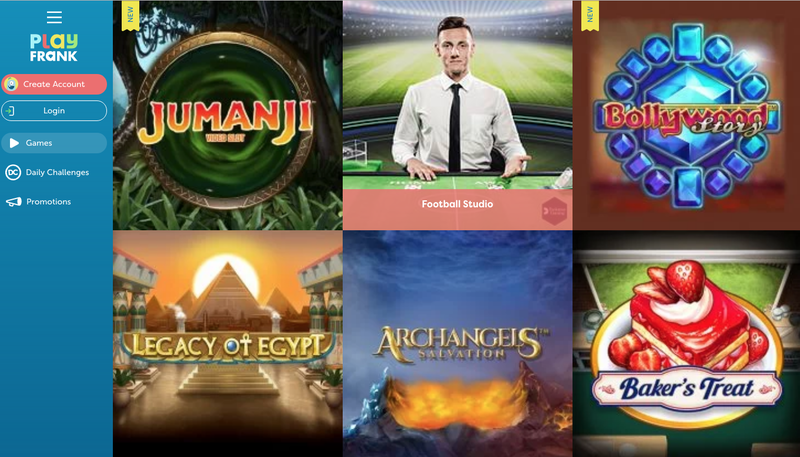 The majority of the design in the centre of the homepage here is taken up by enlarged thumbnails from a host of popular games at PlayFrank, from new releases to old favourites, instantly giving you the sense that there is going to be a lot of choice available here. A reserved, intelligent approach to design has been used to great effect here, as PlayFrank is an excellent looking site, that also manages to feel different. Games here come from a range of the top names in software development, including BetSoft, ELK Studios, Endorphina, GamesOS, IGT Interactive, Microgaming, NetEnt, NextGen Gaming, NYX Gaming, and Play'n GO to name a few. This means that whoever you are, and whatever your preferences, you are going to be well catered for at PlayFrank. If you like slots, you’ll find a range of them, from new releases like Divine Fortune, Lost Vegas, and Cloud Quest, to classic titles including Starburst, Hitman, and Immortal Romance. If you prefer table and card games you’ll find a host of those here two, with various forms of video poker, blackjack, and more, many of which are available in the excellent live casino that is provided by Evolution Gaming. You’ll find a few instant win games here as well if you are the impatient type. PlayFrank isn’t a breathtaking site in terms of offering huge promotions or games that you won’t find anywhere else, but what this site does boast is a wide range of options, and all of them are executed well and packaged beautifully in this chilled, yet fun site. As I said at the beginning, PlayFrank is simply charming, and it’s a great place to find excellent games as well!